Book Review: Nigel Copsey and Matthew Worley (Eds. ), Tomorrow Belongs to Us: The British Far Right since 1967. London: Routledge: Fascism and Far Right Series, 2017. ISBN: 978–1138675179 (paperback). 288 Pages. $45.95. Inside the academy, the study of fascism was notoriously elusive until the 1990s, yet today it is still largely treated like a ghost. Something born out of the tumultuous 1920s, forged through international war and genocide, and only “properly” identified in a handful of European countries, the analysis of that history is often broken by the broadness of the term’s use. As a syncretic, far-right, politic, fascism takes on a mythical sense of rebirth while re-establishing an essentialized identity and hierarchical view of humanity and society. While interwar European fascism had some commonly identifiable features, even if confused by varying levels of racism and viciousness, it was after the war’s conclusion that it really sprouted into a disparate series of barely connected ideologies and movements. It took a couple of decades for the fascist movement, particularly in ruins of Europe’s Second World War, to really find a trajectory. It is in the late 1960s, when both the revolutionary left and right are grappling with their failures through redefinition, that the anthology Tomorrow Belongs To Us attempts to tell a fragmented story of the far-right’s more recent trajectory. Edited by veterans to the scholarship of fascism Nigel Copsey and Matthew Worley, the anthology pieces together critical essays into a picture of how fascism settled into a country that was grappling with its own economic determinism, a cultural revolution through immigration, and a post-colonial identity in shambles. The book launches into history at the point that the National Front creates a viable alternative to the staunch absurdities of Oswald Mosley and Britain’s past fascist cadres, and attempts to appeal to the growing discontent in the English working class over Middle Eastern immigration and social liberalism. John E. Richardson, known for his pioneering history of post-war British fascism written with Copsey, hones in on the nationalist economic discourse that gave the National Front part of its edge, using the same capitalist-critical perspective that became moderately successful with paleoconservatives in the U.S. in the 1980s and 90s. Because the National Front used football and music subcultures as a firm foothold for recruitment, the two chapters on the racist skinhead music scene were expected. This is not a criticism of the choice, and instead both chapters, covering overlapping time periods, helped to flesh out the view of this period and exactly how political initiation mixed with the development of a political identity. Instead of trying to act as a survey, the “snapshot” nature of Tomorrow Belongs to Us is a part of its strength, choosing to dive into subjects that help us to understand the larger themes at play in the growth of various fascist projects in the United Kingdom. For example, Graham Macklin, whose work on third positionist fascism and syncretic Strasserist movements such as National Anarchism has been groundbreaking, chooses to discuss how the successes of Golden Dawn in Greece influenced organizations like the British National Party (BNP). The international coordination that began to take place, particularly in supporting Golden Dawn during its “persecution,” helped to forge a collective group identity as well as to use their moments of violent popularity as a tool to revitalize the failing ranks of more tepid organizations like the BNP. The analysis about the creation of group cohesion, whether around the skinhead Oi! band Skrewdriver or around national socialist “groupuscular” formations, threads throughout the book, echoing much of the work on collective racial identity done by researchers like Kirsten Dyck and Kathleen M. Blee. While there is quite a bit of ground missing in the book, such as the U.K. Independence Party or National Action, they really are not missed since the rest of the chapters are substantial. Craig Fowlie provides an extensive bibliography as the concluding chapter, which ties up the book’s historical framework well and adds to a sense of completeness. 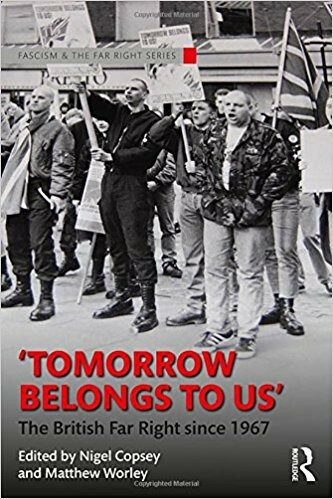 It is hard to discuss Tomorrow Belongs to Us without considering it in the context of the larger Fascism and Far Right series from Routledge. A fairly new book series, editors Nigel Copsey and Graham Macklin, both in this work, have carved out an incredibly unique space that mixes popular appeal (and pricing) with the kind of critical work that is unimpeachable in its scholarship. The series has not turned away from partisan commentary and history as well as been active, both in its publishing and promotions, to link up its publications with the ongoing spread of the far-right parties and groups. There is an urgency to the series, just as there is in the work of Copsey and Macklin, and that weight is present as this anthology unpacks Britain’s racist underbelly. What a reader walks away with is a sense of how fascist movements have bubbled and receded in the English context, and how it could form into a mass populist movement that feeds on crisis. The series is also considering antifascism through a critical lens, presenting the interplay between the far-right and counter-movements as part of a inextricable narrative. With that venture in mind, this thread is less present in Tomorrow Belongs to Us. The only chapter that centers this is Alex Carter’s attempt to use the concept of ‘cumulative extremism’ as a framework for understanding the antagonisms between antifascist activists and the far-right. While there is a useful discussion here about the ways in which ideologies can develop in response to their antithesis, especially when they are appealing to much of the same working class constituency, it scates dangerously close to creating direct comparisons rather than seeing each side as occupying a wholly different cultural, political, and demographic space. It would have been a benefit to actually see Nigel Copsey himself contribute a bit to the representation of antifascism in Britain given his extensive work on the subject, but this again speaks to the fact that what makes this book valuable is that it snapshots specific subjects based on the contributors’ preferences rather than attempting to create an exhaustive chronology. What this anthology reminds us is that there is a wave of contemporary scholarship on fascism that sees current events with just as much value as the Second World War in understanding how the far-right functions and what future political and social relations could evolve into. What the Fascism and Far Right series is doing right is allowing there to be books that can dive into a particular focus, using the current crisis of the far-right as the impetus to create a surge of research that may have been ignored even ten years ago. It is this freedom of inquiry that is recentering the academic study of fascism not just as academic pursuit, but of rediscovered relevance. All scholarship should find this kind of urgency.